With the release of the Parrot’s Bebop drone coming December 1st, IEEE Spectrum took the opportunity to take one for a test flight at an event in New York City. As we’ve previously reported, the Bebop has a number of advanced features, but by far the most fun is the support for first person video flying. A fish-eye lens on the front of the US $500 Bebop allows pilots to look in any direction in a 180-degree field of view, much as a helicopter pilot can look around her without having to rotate or tilt her aircraft. The video can be viewed and the drone controlled using a smartphone or tablet interface as with many of Parrot’s earlier drones, but Parrot also offers a dedicated Skycontroller that attaches to a full size tablet (the Skycontroller is bundled with a BeBop in an $800 package). The antenna on the front of the Skycontroller allows a Bebop to be controlled out to a range of about 1.5 kilometers. In addition, VR glasses can be plugged into the Skycontroller to provide an immersive experience of flying. Parrot says it is working on some compatibility issues with the latest developers version of the Oculus Rift, but once ironed out, the Rift will allow users to look around the drone’s field of view by simply turning their head. As I have a terrible habit of smashing up drones at Parrot’s press events, going all the way back to the original AR Drone’s debut at the 2010 Consumer Electronics Show in Las Vegas, I had some trepidations about flying the Bebop around the event space. However, the joystick-based Skycontroller made flying much easier than using the soft controls on a tablet or smartphone screen. Using the VR glasses made it easier still, eliminating the need to mentally remap left and right joystick manouvers depending whether or not the drone was flying away or towards me. This gave me the confidence and ability to fly the Bebop at higher speeds than I would normally try, as well as sucessfully maneuver it around some of the people gathered around the room, only crashing into a wall, like, one time. This entry was posted in Quadrotor, Robotics and tagged Bebop, Flying, Parrot on November 28, 2014 by enddl22. Parrot’s rolling spider is coming. Recently, Parrot has released a new flying toy named “Rolling spider”. It’s a quite stable platform based on its ancestor’s velocity estimation techniques that basically makes use of optical flow and aerodynamics in a tightly-coupled Kalman Filter. For those whom may interested in the detail, please find the linked. 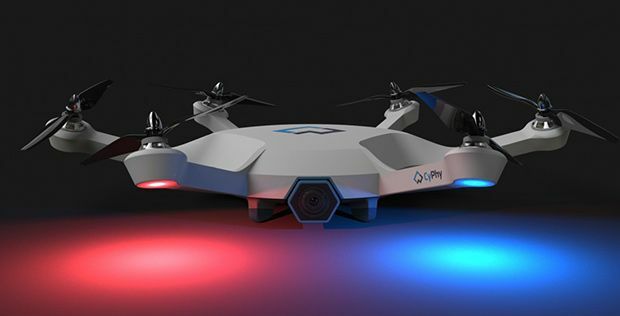 In a nutshell, it can fly up to 7-8 min, the price is around $100-150 and it’s available on a market. This entry was posted in Quadrotor, Robotics and tagged Parrot, Rolling Spider on November 28, 2014 by enddl22.